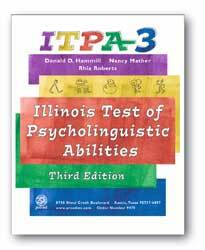 The third edition of the ITPA is totally revised and updated. It is an effective measure of children's spoken and written language. Subtests and composites provide measures of semantics, grammar, phonology, comprehension, spelling, and sight-symbol and sound-symbol processing. 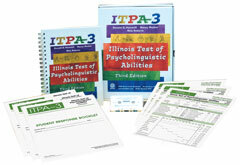 The ITPA-3 provides a wide range of specific information about a child's oral and written language processing and is useful for identifying strengths and weaknesses in linguistic abilities. differentiate between children with poor phonological coding (ability to read and spell phonically regular pseudowords) and those with poor orthographic coding (ability to read and spell words with an irregular element). Furthermore, the Sight-Symbol processing and Sound-Symbol processing scores help identify deficits in written symbol processing, which can aid in planning appropriate strategies and accommodations. 1. Spoken Analogies: The examiner says a four-part analogy, of which the last part is missing. The child then tells the examiner the missing part. For example, in response to "Birds fly, fish _____," the child might say, "swim. 2. Spoken Vocabulary: The examiner says a word that is actually an attribute of some noun. For example, the examiner may say, "I am thinking of something with a roof," to which the child might respond, "house. 3. Morphological Closure: The examiner says an oral prompt with the last part missing. For example, the examiner says, "big, bigger, ___," and the child completes the phrase by saying the missing part, "biggest. 4. Syntactic Sentences: The examiner says a sentence that is syntactically correct but semantically nonsensical (e.g., "Red flowers are smart"). The child repeats the sentence. 5.Sound Deletion: The examiner asks the child to delete words, syllables, and their phonemes from spoken words. For example, the examiner might ask the student to say "weekend" without the "end. 7. Sentence Sequencing: The child reads a series of sentences silently and then orders them into a sequence to form a plausible paragraph. For example, if the following three sentences were rearranged in B, C, A order they would make sense: A. I go to school. B. I get up. C. I get dressed. 8. Written Vocabulary: After reading an adjective (e.g., "A broken ____"), the child responds by writing a noun that is closely associated with the stimulus word (e.g., "vase" or "mirror). 9. Sight Decoding: The child pronounces a list of printed words that contain irregular parts (e.g., "would," "laugh," "height," "recipe). 10. Sound Decoding: The child reads aloud phonically regular names of make-believe animal creatures (e.g., Flant, Yang). 11. Sight Spelling: The examiner reads aloud irregular words one by one in a list. The child is given a printed list of these words, in which the irregular part of the words and one or more phonemes are missing. He or she writes in the omitted part of the words. For example, the examiner says, "said," the child sees s___d, and he or she writes in the missing letters, "ai. 12. Sound Spelling: The examiner reads aloud phonically regular nonsense words, and the child writes the word or the missing part. The 12 subtests of the ITPA-3 can be individually administered in 45 to 60 minutes. Subtest scores are combined to form 7 specific composite scores as well as general composite scores for spoken, written, and overall language. All scores can be reported in standard scores, percentile ranks, and age equivalents based on a nationally representative sample of children.